Steinway Artist Simon Callaghan performs internationally as a soloist and chamber musician. His recent tours have taken him to Japan, Malaysia, Thailand, Hong Kong, throughout Europe and on two occasions to the Banff Centre in Canada. He has performed at all of the UK’s major concert halls including Wigmore Hall, Royal Festival Hall, Birmingham Symphony Hall, Liverpool Philharmonic Hall, St David’s Hall Cardiff and Manchester’s Bridgewater and Stoller Halls. Simon’s interest in rarely performed works has led to invitations to perform concerti by Françaix and Tippett, and to give the first UK performance since 1946 of Medtner’s 3rd Concerto, which he will perform again in 2018. His rapidly-expanding discography includes solo works by Sterndale Bennett, Parry, Sacheverell Coke, chamber music by Brahms, Schumann, Chopin, and two volumes of Delius with Parnassius Duo partner, Hiro Takenouchi (on Somm). In 2017 he released his debut CD for Hyperion’s lauded Romantic Piano Concerto series: the first recordings of Roger Sacheverell Coke’s Concerti with the BBC Scottish Symphony Orchestra and Martyn Brabbins. The disc reached No.3 in the specialist classical charts, the top ten in the Classic FM chart and garnered enthusiastic reviews across the press. Festival invitations have included Highgate, Husum, Whittington and Cervo Chamber Music. Callaghan has also performed frequently on BBC radio and television. In chamber music he has collaborated with Ning Feng, Jack Liebeck, Giovanni Guzzo, Tim Hugh, Thomas Gould, Raphael Wallfisch and the actors Timothy and Samuel West, and Prunella Scales. His extensive repertoire has included complete cycles of Beethoven and Brahms chamber works, and a three-concert residency at St John’s Smith Square in London, exploring the piano quartet medium. Contemporary music performances have included works by Joseph Phibbs, Julian Anderson and Kenneth Hesketh, and he was invited by the Royal College of Music to play Boulez’s ‘Dérive II’ as part of their ‘Variable Geometry’ series. His world premiere recording of Paul Patterson’s ‘Allusions’ for two violins and piano (with Midori Komachi and Sophie Rosa) was released in 2017. 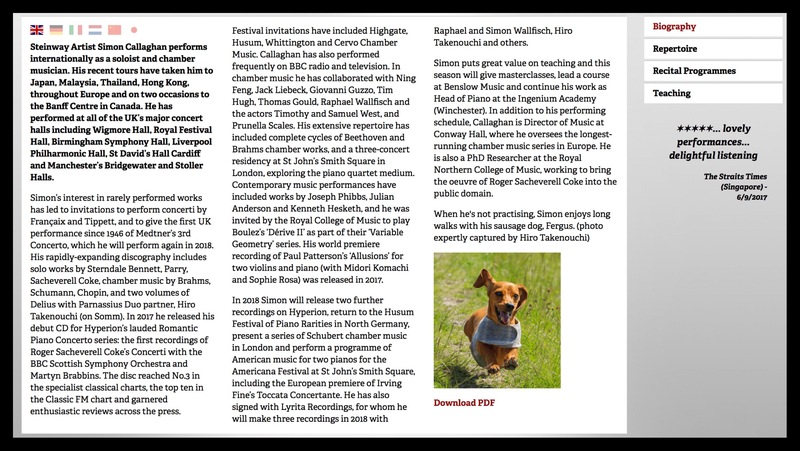 In 2018 Simon will release two further recordings on Hyperion, return to the Husum Festival of Piano Rarities in North Germany, present a series of Schubert chamber music in London and perform a programme of American music for two pianos for the Americana Festival at St John’s Smith Square, including the European premiere of Irving Fine’s Toccata Concertante. He has also signed with Lyrita Recordings, for whom he will make three recordings in 2018 with Raphael and Simon Wallfisch, Hiro Takenouchi and others. Simon puts great value on teaching and this season will give masterclasses, lead a course at Benslow Music and continue his work as Head of Piano at the Ingenium Academy (Winchester). In addition to his performing schedule, Callaghan is Director of Music at Conway Hall, where he oversees the longest-running chamber music series in Europe. He is also a PhD Researcher at the Royal Northern College of Music, working to bring the oeuvre of Roger Sacheverell Coke into the public domain. When he’s not practising, Simon enjoys long walks with his sausage dog, Fergus.